Come support local art and artists at the San Jose Holiday Art Market this weekend! The event takes place at the Historic Reed House (San Jose Landmark #160) at 328 North 6th Street from 11am-4pm and you can see some of the items that were sold last year at http://sjartmarket.wix.com/shop. More information below. 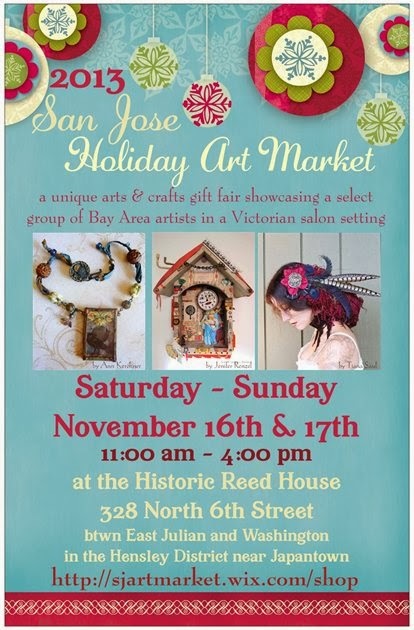 The San Jose Holiday Art Market returns to the Historic Reed House for its 3rd annual exhibition the weekend of November 16th & 17th. This exquisite arts, crafts, & design fair is free to attend and will run from 11am - 4pm each day, providing an excellent and fun opportunity to get a jump start on your holiday shopping. A beautiful Victorian home in the Hensley District, the Historic Reed House is classified as San Jose's landmark #160. A unique and intimate salon setting will feature a top-notch group of select Bay Area talents. Complimentary tea and holiday sweets will be offered on both days. Expect to find a wide variety of incredible handmade goods at the Market - ranging from assemblage, dolls, jewelry, paintings, photography, sculpture, terrariums, and more. For every $10 spent, customers will receive a raffle ticket to enter in an hourly drawing. Winners will be awarded handmade, original works donated by participating artists.